TPID: Tag Protocol Identifier begins at byte 12 (after the 6 byte destination and source fields), is 2 bytes long, and has an Ether type of 0x8100 for tagged traffic. 802.1p: The first three bits of the TCI (Tag Control Information – beginning at byte 14, and spanning 2 bytes) define user priority, giving eight (2^3) priority levels. IEEE 802.1p defines the operation for these 3 user priority bits. CFI: Canonical Format Indicator is a single-bit flag, always set to zero for Ethernet switches. CFI is used for compatibility reasons between Ethernet networks and Token Ring networks. If a frame received at an Ethernet port has a CFI set to 1, then that frame should not be forwarded as it is to an untagged port. VLAN ID: VLAN ID (starts at bit 5 of byte 14) is the identification of the VLAN. It has 12-bits and allows for the identification of 4,096 (2^12) unique VLAN ID’s. Of the 4,096 possible IDs, an ID of 0 is used to identify priority frames, and an ID of 4,095 (FFF) is reserved, so the maximum possible VLAN configurations are 4,094. 802.1p support begins by enabling 802.1p marking on the interfaces which you wish to have process 802.1p tags. 802.1p can be enabled on any Ethernet interface on any SonicWALL appliance. The behavior of the 802.1p field within these tags can be controlled by Access Rules. The default 802.1p Access Rule action of None will reset existing 802.1p tags to 0, unless otherwise configured (see Managing QoS Marking for details). Enabling 802.1p marking will allow the target interface to recognize incoming 802.1p tags generated by 802.1p capable network devices, and will also allow the target interface to generate 802.1p tags, as controlled by Access Rules. Frames that have 802.1p tags inserted by SonicOS will bear VLAN ID 0. 802.1p tags will only be inserted according to Access Rules, so enabling 802.1p marking on an interface will not, at its default setting, disrupt communications with 802.1p-incapable devices. To process 802.1p tags, the feature must be present and enabled on the network interface. The network interface will then be able to generate packets with 802.1p tags, as governed by QoS capable applications. By default, general network communications will not have tags inserted so as to maintain compatibility with 802.1p-incapable devices. NOTE: If your network interface does not support 802.1p, it will not be able to process 802.1p tagged traffic, and will ignore it. Make certain when defining Access Rules to enable 802.1p marking that the target devices are 802.1p capable. It should also be noted that when performing a packet capture (for example, with the diagnostic tool Ethereal) on 802.1p capable devices, some 802.1p capable devices will not show the 802.1q header in the packet capture. Conversely, a packet capture performed on an 802.1p-incapable device will almost invariably show the header, but the host will be unable to process the packet. Before moving on to Managing QoS Marking , it is important to introduce ‘DSCP Marking’ because of the potential interdependency between the two marking methods, as well as to explain why the interdependency exists. In the scenario above, we have Remote Site 1 connected to ‘Main Site’ by an IPsec VPN. The company uses an internal 802.1p/DSCP capable VoIP phone system, with a private VoIP signaling server hosted at the Main Site. The Main Site has a mixed gigabit and Fast-Ethernet infrastructure, while Remote Site 1 is all Fast Ethernet. Both sites employ 802.1p capable switches for prioritization of internal traffic. PC-1 at Remote Site 1 is transferring a 23 terabyte PowerPoint™ presentation to File Server 1, and the 100mbit link between the workgroup switch and the upstream switch is completely saturated. At the Main Site, a caller on the 802.1p/DSCP capable VoIP Phone 10.50.165.200 initiates a call to the person at VoIP phone 192.168.168.200. The calling VoIP phone 802.1p tags the traffic with priority tag 6 (voice), and DSCP tags the traffic with a tag of 48. If the link between the Core Switch and the firewall is a VLAN, some switches will include the received 802.1p priority tag, in addition to the DSCP tag, in the packet sent to the firewall; this behavior varies from switch to switch, and is often configurable. If the link between the Core Switch and the firewall is not a VLAN, there is no way for the switch to include the 802.1p priority tag. The 802.1p priority is removed, and the packet (including only the DSCP tag) is forwarded to the firewall. When the firewall sent the packet across the VPN/WAN link, it could include the DSCP tag in the packet, but it is not possible to include the 802.1p tag. This would have the effect of losing all prioritization information for the VoIP traffic, because when the packet arrived at the Remote Site, the switch would have no 802.1p MAC layer information with which to prioritize the traffic. The Remote Site switch would treat the VoIP traffic the same as the lower-priority file transfer because of the link saturation, introducing delay—maybe even dropped packets—to the VoIP flow, resulting in call quality degradation. So how can critical 802.1p priority information from the Main Site LAN persist across the VPN/WAN link to Remote Site LAN? Through the use of QoS Mapping. QoS Mapping is a feature which converts layer 2 802.1p tags to layer 3 DSCP tags so that they can safely traverse (in mapped form) 802.1p-incapable links; when the packet arrives for delivery to the next 802.1p-capable segment, QoS Mapping converts from DSCP back to 802.1p tags so that layer 2 QoS can be honored. In our above scenario, the firewall at the Main Site assigns a DSCP tag (for example, value 48) to the VoIP packets, as well as to the encapsulating ESP packets, allowing layer 3 QoS to be applied across the WAN. This assignment can occur either by preserving the existing DSCP tag, or by mapping the value from an 802.1p tag, if present. When the VoIP packets arrive at the other side of the link, the mapping process is reversed by the receiving SonicWALL, mapping the DSCP tag back to an 802.1p tag. The receiving SonicWALL at the Remote Site is configured to map the DSCP tag range 48-55 to 802.1p tag 6. When the packet exits the firewall, it will bear 802.1p tag 6. The Switch will recognize it as voice traffic, and will prioritize it over the file-transfer, guaranteeing QoS even in the event of link saturation. DSCP (Differentiated Services Code Point) marking uses 6-bits of the 8-bit ToS field in the IP Header to provide up to 64 classes (or code points) for traffic. Since DSCP is a layer 3 marking method, there is no concern about compatibility as there is with 802.1p marking. Devices that do not support DSCP will simply ignore the tags, or at worst, they will reset the tag value to 0. The above diagram depicts an IP packet, with a close-up on the ToS portion of the header. The ToS bits were originally used for Precedence and ToS (delay, throughput, reliability, and cost) settings, but were later repurposed by RFC2474 for the more versatile DSCP settings. The following table shows the commonly used code points, as well as their mapping to the legacy Precedence and ToS settings. DSCP marking can be performed on traffic to/from any interface and to/from any zone type, without exception. DSCP marking is controlled by Access Rules, from the QoS tab, and can be used in conjunction with 802.1p marking, as well as with SonicOS’ internal bandwidth management. Among their many security measures and characteristics, IPsec VPNs employ anti-replay mechanisms based upon monotonically incrementing sequence numbers added to the ESP header. Packets with duplicate sequence numbers are dropped, as are packets that do not adhere to sequence criteria. One such criterion governs the handling of out-of-order packets. SonicOS provides a replay window of 64 packets, i.e. if an ESP packet for a Security Association (SA) is delayed by more than 64 packets, the packet will be dropped. This should be considered when using DSCP marking to provide layer 3 QoS to traffic traversing a VPN. If you have a VPN tunnel that is transporting a diversity of traffic, some that is being DSCP tagged high priority (e.g. VoIP), and some that is DSCP tagged low-priority, or untagged/best-effort (e.g. FTP), your service provider will prioritize the handling and delivery of the high-priority ESP packets over the best-effort ESP packets. Under certain traffic conditions, this can result in the best-effort packets being delayed for more than 64 packets, causing them to be dropped by the receiving SonicWALL’s anti-replay defenses. If symptoms of such a scenario emerge (e.g. excessive retransmissions of low-priority traffic), it is recommended that you create a separate VPN policy for the high-priority and low-priority classes of traffic. This is most easily accomplished by placing the high-priority hosts (e.g. the VoIP network) on their own subnet. If you want to change the inbound mapping of DSCP tag 15 from its default 802.1p mapping of 1 to an 802.1p mapping of 2, it would have to be done in two steps because mapping ranges cannot overlap. Attempting to assign an overlapping mapping will give the error DSCP range already exists or overlaps with another range. First, you will have to remove 15 from its current end-range mapping to 802.1p CoS 1 (changing the end-range mapping of 802.1p CoS 1 to DSCP 14), then you can assign DSCP 15 to the start-range mapping on 802.1p CoS 2. NOTE: Mapping will not occur until you assign Map as an action of the QoS tab of an Access Rule. The mapping table only defines the correspondence that will be employed by an Access Rule’s Map action. For example, according to the default table, an 802.1p tag with a value of 2 will be outbound mapped to a DSCP value of 16, while a DSCP tag of 43 will be inbound mapped to an 802.1 value of 5. You can restore the default mappings by clicking the Reset QoS Settings button. QoS marking is configured from the QoS tab of Access Rules under the Firewall > Access Rules page of the management interface. Both 802.1p and DSCP marking as managed by SonicOS Access Rules provide 4 actions: None, Preserve, Explicit, and Map. The default action for DSCP is Preserve and the default action for 802.1p is None. When packets matching this class of traffic (as defined by the Access Rule) are sent out the egress interface, no 802.1p tag will be added. The DSCP tag is explicitly set (or reset) to 0. If the target interface for this class of traffic is a VLAN subinterface, the 802.1p portion of the 802.1q tag will be explicitly set to 0. If this class of traffic is destined for a VLAN and is using 802.1p for prioritization, a specific Access Rule using the Preserve, Explicit, or Map action should be defined for this class of traffic. Existing 802.1p tag will be preserved. Existing DSCP tag value will be preserved. An explicit 802.1p tag value can be assigned (0-7) from a drop-down menu that will be presented. An explicit DSCP tag value can be assigned (0-63) from a drop-down menu that will be presented. If either the 802.1p or the DSCP action is set to Explicit while the other is set to Map, the explicit assignment occurs first, and then the other is mapped according to that assignment. 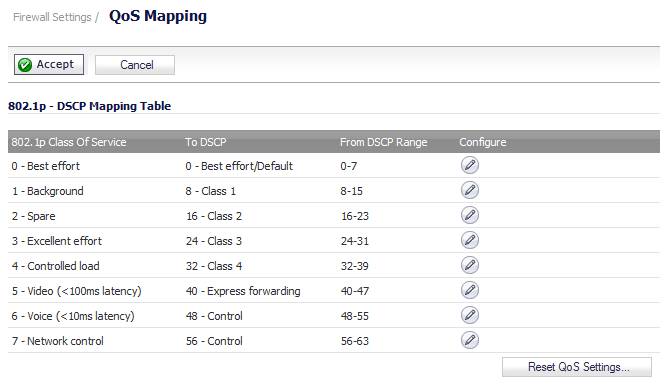 The mapping setting defined in the Firewall Settings > QoS Mapping page will be used to map from an 802.1 tag to a DSCP tag. An additional checkbox will be presented to Allow 802.1p Marking to override DSCP values. Selecting this checkbox will assert the mapped 802.1p value over any DSCP value that might have been set by the client. This is useful to override clients setting their own DSCP CoS values. If Map is set as the action on both DSCP and 802.1p, mapping will only occur in one direction: if the packet is from a VLAN and arrives with an 802.1p tag, then DSCP will be mapped from the 802.1p tag; if the packet is destined to a VLAN, then 802.1p will be mapped from the DSCP tag. For example, refer to the following figure which provides a bi-directional DSCP tag action. HTTP access from a Web-browser on 192.168.168.100 to the Web server on 10.50.165.2 will result in the tagging of the inner (payload) packet and the outer (encapsulating ESP) packets with a DSCP value of 8. When the packets emerge from the other end of the tunnel, and are delivered to 10.50.165.2, they will bear a DSCP tag of 8. When 10.50.165.2 sends response packets back across the tunnel to 192.168.168.100 (beginning with the very first SYN/ACK packet) the Access Rule will tag the response packets delivered to 192.168.168.100 with a DSCP value of 8. This behavior applies to all four QoS action settings for both DSCP and 802.1p marking. One practical application for this behavior would be configuring an 802.1p marking rule for traffic destined for the VPN zone. Although 802.1p tags cannot be sent across the VPN, reply packets coming back across the VPN can be 802.1p tagged on egress from the tunnel. This requires that 802.1p tagging is active of the physical egress interface, and that the [Zone] > VPN Access Rule has an 802.1p marking action other than None. After ensuring 802.1p compatibility with your relevant network devices, and enabling 802.1p marking on applicable SonicWALL interfaces, you can begin configuring Access Rules to manage 802.1p tags. VoIP traffic (as defined by the Service Group) from LAN Primary Subnet destined to be sent across the VPN to Main Site Subnets would be evaluated for both DSCP and 802.1p tags. The combination of setting both DSCP and 802.1p marking actions to Map is described in the table earlier in Managing QoS Marking . Sent traffic containing only an 802.1p tag (e.g. CoS = 6) would have the VPN-bound inner (payload) packet DSCP tagged with a value of 48. The outer (ESP) packet would also be tagged with a value of 48. Assuming returned traffic has been DSCP tagged (CoS = 48) by the firewall at the Main Site, the return traffic will be 802.1p tagged with CoS = 6 on egress. Sent traffic containing only a DSCP tag (e.g. CoS = 48) would have the DSCP value preserved on both inner and outer packets. Sent traffic containing only both an 802.1p tag (e.g. CoS = 6) and a DSCP tag (e.g. CoS = 63) would give precedence to the 802.1p tag, and would be mapped accordingly. The VPN-bound inner (payload) packet DSCP tagged with a value of 48. The outer (ESP) packet would also be tagged with a value of 48. To examine the effects of the second Access Rule (VPN>LAN), we’ll look at the Access Rules configured at the Main Site. VoIP traffic (as defined by the Service Group) arriving from Remote Site 1 Subnets across the VPN destined to LAN Subnets on the LAN zone at the Main Site would hit the Access Rule for inbound VoIP calls. Traffic arriving at the VPN zone will not have any 802.1p tags, only DSCP tags. Traffic exiting the tunnel containing a DSCP tag (e.g. CoS = 48) would have the DSCP value preserved. Before the packet is delivered to the destination on the LAN, it will also be 802.1p tagged according to the QoS Mapping settings (e.g. CoS = 6) by the firewall at the Main Site. Assuming returned traffic has been 802.1p tagged (e.g. CoS = 6) by the VoIP phone receiving the call at the Main Site, the return traffic will be DSCP tagged according to the conversion map (CoS = 48) on both the inner and outer packet sent back across the VPN. Assuming returned traffic has been DSCP tagged (e.g. CoS = 48) by the VoIP phone receiving the call at the Main Site, the return traffic will have the DSCP tag preserved on both the inner and outer packet sent back across the VPN. Assuming returned traffic has been both 802.1p tagged (for example, CoS = 6) and DSCP tagged (for example, CoS = 14) by the VoIP phone receiving the call at the Main Site, the return traffic will be DSCP tagged according to the conversion map (CoS = 48) on both the inner and outer packet sent back across the VPN.